Musical Paradise MP-301 MK3 (2013 Deluxe Version). $339 plus shipping of $60 to North America. Many audiophiles spend thousands of dollars in search of the system that best suits their needs. We might cycle through five, ten, even twenty amplifiers over the course of a decade before we settle upon the one that makes our heart sing. Fine audio is like fine wine–taste a great wine, and there is no going back to inexpensive, mass-produced plonk. There are affordable bottles that rival the great ones, but they are very hard to find. Listen to a magical sound system, and it becomes difficult to settle for bright, thin, brittle low-budget sound. But what if I told you that in realm of the aural senses, you could, with certain limitations, have $5000 sound for $339 (plus $60 shipping)? Single-ended ambrosia for the price of a throwaway-LCD television? Look no further than Edmonton, Alberta, home of one Mr. Garry Huang, owner and holder of the keys to Musical Paradise. As the Wall of Sound website was being conceived, the founder Noam Bronstein and I agreed that, of all the amplifiers we had both owned over the past several years–and there were dozens–the one that represented the best bang for the buck was, without doubt, the Musical Paradise MP-301 MK2 and MK3. What better way to inaugurate a new website devoted to affordable and mid-priced audio than to profile this brand, well reviewed in online forums, but neglected by the audio press? Noam and I have both owned the Musical Paradise MP-428 mk2 (a 300b/2a3-based SET amp, discontinued) and agreed that it was likely the best $700 300B amp on the market. Today we both own the MP-301. In fact, I own three–the MP-301 mk2 from 2011, which resides in my family room on top of a bookcase where it feeds the marvelous Mordaunt Short Carnival 2 speakers, safe from my toddler’s curiosity; the MP-301 mk3 from 2012, which resides in my office and is paired with the giant-killer Pioneer SP-BS21-LR speakers; and the MP-301 Mk3 2013 Deluxe edition, which sees occasional time in my listening room, where I pair it with Harbeth Compact 7s or Tekton M-Lore speakers. Headphones used include Beyerdynamic DT770, DT880 and T1 as well as HiFiMan HE-400. If I listened to nothing but piano sonatas and solo classical guitar works I could live with this amp indefinitely. It’s that good. It simply nails the tone of a guitar and it hangs onto the decay of a piano note like no other budget-priced amp I have heard. The business plan is simple and timeworn: design a product in a rich nation and outsource the production to China or another emerging market economy. But Garry Huang was never content to leave it at that. He has tweaked his products over the last five years. He has listened to his customers’ feedback. And this man stands by his products. The original MP-301 mk1 was based on the 6V6 output tube and while it sounded wonderful with speakers, its headphone section was plagued by excessive hum, especially with the stock tubes and with low-impedance headphones. But for $200, who could complain? Single-ended tube amps are a dime-a-dozen on Ebay these days, but good luck with customer service when you have to ship the thing back to China at your expense. A 10 kg package sent via airmail will cost over $200 round-trip. Buying your Chinese-made amp through a Canadian company, and getting it serviced in Canada if need be, is a far more attractive proposition. Having bought four amplifiers and one DAC from Garry Huang, I can attest that he has responded to customer emails and provided excellent customer service. When I had a cold-soldered Shuguang 300b tube, Garry sent me a new one within hours. The MP-301 MK3 ships from China but is serviced in Canada should the need arise. (The Musical Paradise DAC that I ordered in December shipped from Canada, as did the previous versions of the MP-301). With the MP-301 MK2, introduced three years ago, quality control was improved drastically. If you find one on the used market, buy it. It’s 80 to 90% as good as the current production unit, the MK3. Casework was now smooth and shiny, punching well above its price point. 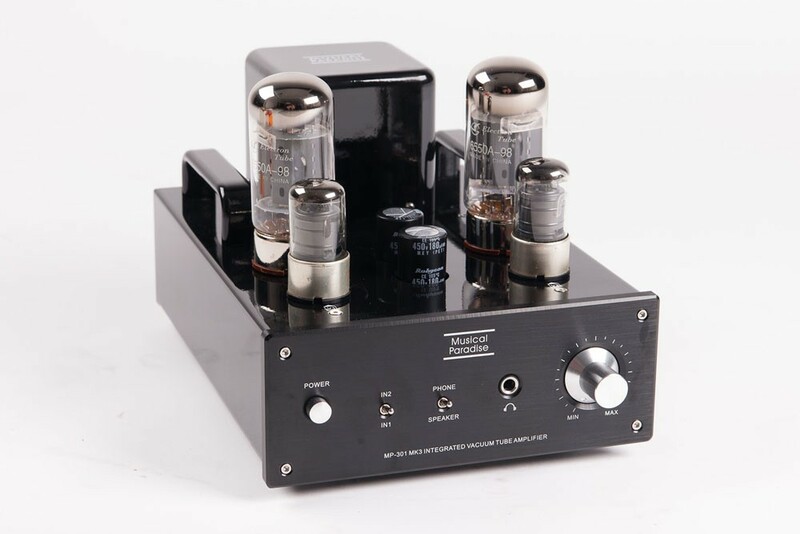 The second iteration of the MP-301 was designed around the 6L6/EL34 output tube and everything was upgraded, from the transformers to the capacitors and resistors. Power output jumped to roughly 6.5 – 8.0 watts, depending on the output tube used, but the amp sounded more powerful than that. The amp now came with two inputs and a front-panel toggle switch for both inputs and headphones/speakers. The hum issue was addressed to the satisfaction of most listeners with 600 Ohm headphones. With the 2012 MK3 and the 2013 MK3 Deluxe Version, the hum issue is virtually eliminated regardless of headphone impedance. In my experience, through three different Beyerdynamic headphones, (DT 770, 880 and the magnificent T1) the MK3 was quieter than the amazing Decware CSP2+ headphone amp (though not dead quiet, like my Bottlehead Crack amp). With my HiFiMan HE-400 headphones, as with the Beyer T1s, this is a world-class headphone amplifier, nearly as good as Decware’s finest. It is liquid and propulsive, armed with enough juice to drive difficult loads. It is open and airy with a massive soundstage–just as it is with loudspeakers. The headphone amp itself is worth the price of admission. It smokes my Audiolab M-DAC–no slouch itself. The MP-301 MK3 does not smoke my Crack amp, but it compares favorably. Never had it so good. An embarrassment of riches. I preferred the Musical Paradise MP-301 MK3 (bottom left) to the Burson (top) and it is almost as good a headphone amp as the Bottlehead Crack (right). The MP is shown here with red NOS RCA 5693s and Shuguang Black Treasure 6CA7 (EL34). Isolation devices: DIY maple. The inexpensive Marantz CD-5004 is a wonderful match. Pictured on the left, my sadly departed Beyerdynamic T1s. Amazing headphones with the MP. Even as Garry Huang was tweaking and improving a top-notch product, he never got greedy. Even after several years of rave reviews on internet sites, he never jacked up his prices except to reflect the higher costs of better parts. To be sure, the MK3 was now priced at $339, a jump of $40 over the MK2, but it comes with an ALPS volume pot, a high-quality PCB board, a larger EI core made of Japanese silicon steel, Vishay military resistors, not to mention Rubycon and Nichicon capacitors! Needless to say, nothing being produced in North America or Europe can approach this amp at this price. For a comparable North American or European-made single-ended EL34 amp, the entry point is $1200 but you won’t get a headphone amp included. With the MP-301, we are talking about the warm glow of tubes, single-ended class A sound, for under $500, even when you include upgraded tubes. Think of your favorite Kenny Burrell or Joe Pass or Kurt Rosenwinkel cd. If you want their guitars to send forth golden, liquid notes, dense, thick, saturated in tone–but ethereal and airy as well, without getting slow and sticky–then this amp is for you. If you want to rock the cradle of love with Steve Stevens of Billy Idol’s band, look elsewhere. I have owned two Primaluna Prologue One amps and I have loved them. When they departed from my house in order to fund other gear, I shed a tear or two. But the entry level Primaluna, now priced at $1800, is not four times better than the MP-301 MK3, nor is it twice as good. I consider the MP-301 MK3 to be a low-powered equivalent to the amazing Primaluna Prologue One. I have demo’ed the two amps side by side on several occasions. The only way in which the MP-301 falls short is in the volume: it needs speakers of about 89db sensitivity or higher, and it needs a small to medium room. And obviously this small amplifier will not convey the visceral primitivism of the Rites of Spring or other complex orchestral music. But what it can do is bring the late great Jim Hall, Jimmy Giuffre, and Ray Brown (The Jimmy Giuffre 3 “The Easy Way” cd) into your living room, producing a “you-are-there” sensation. Chamber music and jazz trios or quartets featuring string instruments, woodwinds and guitars love this amp. Vocals are lifelike. This amp can capture the reedy flutter of Eric Dolphy’s bass clarinet and Paul Desmond’s alto sax, it can convey the reverberant romanticism of Marcin Wasilewski’s piano (Trio, ECM 1891), and it can allow you to feel the tremolo of Glen Campbell’s Fender Bass VI guitar. Bass is meaty and ripe, but not especially dry. 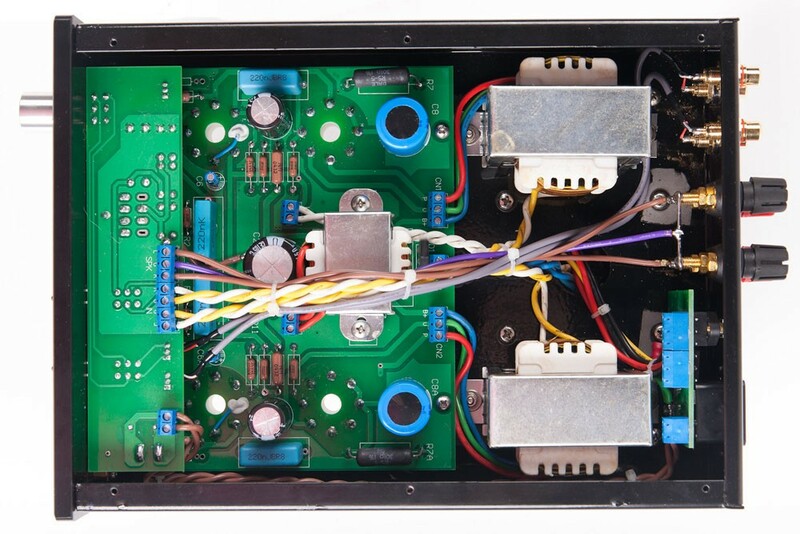 This amp lacks the ultimate depth you would expect with high-current solid state, but what it does do, it does well. It does not offend. Upper-mid bass is sublime. Voices carry and woodwinds soar. Clarinet is rendered in the most exquisite fashion by this amp. Within hours of seeing the great jazz clarinetist Anat Cohen in concert in 2012 in my hometown, I listened to her mesmerizing “Notes from the Village” cd. At that moment I was convinced that the Musical Paradise MP-301 MK2 was the best amplifier $300 could buy. With the new and improved MP-301 MK3 (2013 Deluxe version), we go to a higher level. The amp is more dynamic and slightly quieter, but it gives up none of its predecessors’ warmth. This heavier, beefier, sleeker, more polished amp can take the KT88 power tube. This opens up the possibility of using the great Genelex Gold Lion or the even better Psvane black bottle KT88–in my experience, one of the best power tubes ever made. Now you will get close to 10 watts of power, enough to rock the house with, say, some marvelous Tekton Design M-Lore speakers (95db, 8 Ohm). With the MP and Tektons paired to an Audiolab M-DAC, Geddy Lee’s crunchy Rickenbacker is surprisingly dry and visceral. Even Harbeth Compact 7s (86db, 6 Ohm, but a very benign load) will be amply powered in a small to medium room. The brilliant guitarist Graham Anthony Devine has produced perhaps the most hypnotic recording of Leo Brouwer’s “Hika” available on disc. (It is a 7-minute composition dedicated to Toru Takemitsu; Brouwer, Guitar Music vol. 3, Naxos 8.554195.) The little MP-301 MK3 renders this music more beautiful than some amps priced in the five figures. You won’t use this amp for Metallica or Mahler’s 4th, but if you’d like Tierney Sutton or Jane Monheit in your listening room–and why wouldn’t you?–then this amp is for you. If you are comfortable with these limitations, then pull out your plastic and buy this fantastic amp. There is just one caveat: to get the best possible sound from the MP-301 MK3 (and the MK2) you must upgrade the stock Chinese-made tubes. These are low-quality NOS from the 1970s and 1980s. Keep them as back-ups. But you need not break the bank: $20 to 40 for some good pre-amp tubes (the Musical Paradise website offers suggestions). And another $35 to $100 for a pair of power tubes. 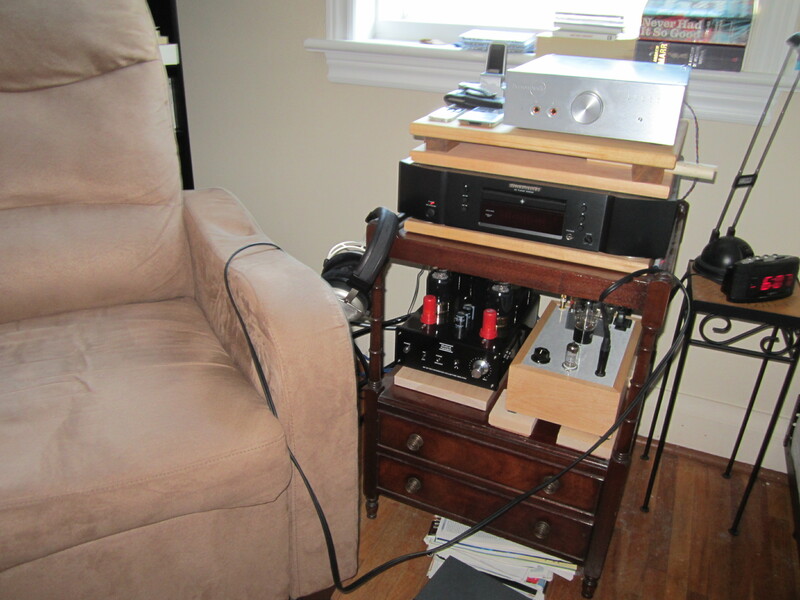 As an auto-biasing amp, you are free to roll 5881s, 6L6s, EL34s, KT66s, KT88s and 6550s. In my experience, the 6L6 family sounds best in the MK2 and the KT88 sounds best in the MK3, but the difference is minimal. I had my best experience with 6L6s from TAD and SED Winged C. The current production Tung Sol 5881 also sounds wonderful, but your power output will drop. I found that NOS RCA 6L6s sounded a bit too soft. The KT88 is by far the crunchiest and most dynamic tube of the lot; I find the 6L6 to be the best all-rounder. For a couple of decades at least, Harbeth, Rogue, Odyssey Audio, and Rega have produced, in high-wage nations, world-class audio equipment at prices the average consumer can afford with a few months or a year or two of savings. Now Musical Paradise is producing world-class equipment that even the average teenager in a rich country can afford. (If only teens could be wooed away from the crime-against-the-ear that is MP3). Musical Paradise of Canada should be considered in the same breath with Primaluna, Vincent and other brands designed in Europe or North America but manufactured in China. The chief difference is that the price of admission to Primaluna, once just $1300, is now $1800 USD. But with just three easy payments of $133 (including shipping), you can have Musical Paradise. You can knock on the high-end’s door. How could you ask for more? I swear that I could listen forever. To this amp. Paradise. Great review, Tim. Two observations; I found the build quality of the MP-301 (Mk2 and Mk3) to be noticeably superior to the MP-428 Mk2. The SET amp sounded great, but was point-to-point wired and the soldering and layout left a lot to be desired. Secondly, I agree on the need to swap out the stock MP-301’s tubes. Especially the driver tubes – the stock ones are really cheap and prone to hum/noise. I had good luck with black-body RCA 6SJ7’s. I am using the Tung Sol EL34s now with great success. I am looking forward to the Musical Paradise MP-303 amplifier/DAC review, and hoping that this bargain is my next purchase. When can we expect time review? Ben: unfortunately the review sample developed a problem and we had the cancel that review. Tim is currently reviewing the new MP-D2 DAC. This is the sort of thing I’m reading in review after review of MP offerings and to say the least, it’s giving me pause. You can also see a fair number of non-working “as-is” offerings at the usual sites from people who are unable to fix their units. I’ve had my MP-303 for the last 10+ months powering some front ported bookshelf speakers for my office without a problem. USB driver seems pretty robust too. As for my MP-301, she’s been shining as a headphone amp for the past 18+ months and its constant beauty (those lights and the sound!) is why I’m a repeat customer. No complaints here and well worth a low entre fee.